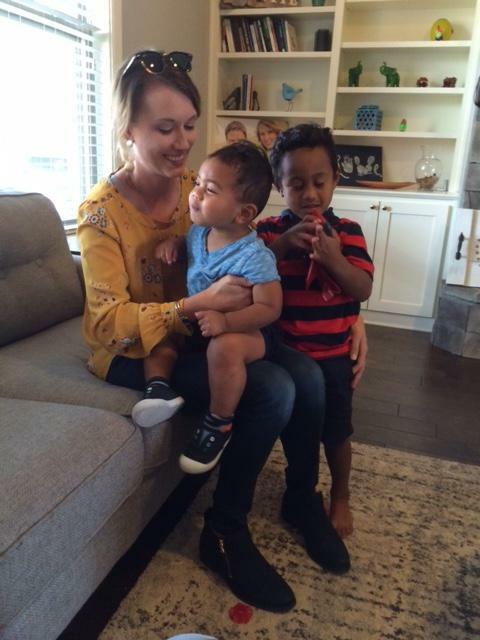 Michaela Montie sits with her two adopted Marshallese sons inside their Roger's home. Montie is founder and executive director of Shared Beginnings, a nonprofit group that serves expectant moms wishing to protect their baby's future through adoption, including Marshallese birth mothers. As many as 15,000 people from the Republic of the Marshall Islands have moved to Northwest Arkansas to work, obtain health care and raise their children. But unlike the American nuclear family, islanders traditionally may relinquish their children to the care of relatives and clan members, if in dire need. By extension, a growing number of impoverished pregnant Marshallese women in Arkansas are consenting to private legal adoptions to improve their children’s welfare as well as to secure medical and living expenses. But some may not understand that they risk losing all contact with their child, under traditional Arkansas adoption rules. This autumn, community advocates and lawyers are laboring to protect the interests of both islander birth moms and parents wishing to adopt Marshallese babies. A majority of private adoptions in northwest Arkansas now involve Marshallese birth mothers, says Melisa Laelan. She’s founder and president of Arkansas Coalition of Marshallese headquartered in Springdale. The nonprofit agency assists migrant islanders with legal and residency questions. But as a Marshallese court interpreter, Laelan says she’s witnessing too many Marshallese child adoption consent proceedings. “The culprit of all this is the money,” she says. 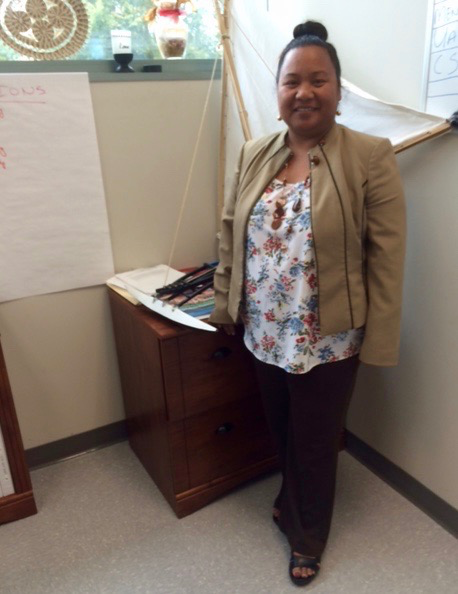 Melisa Laelan, founder and executive director of Arkansas Coalition of Marshallese in Springdale works for the welfare of Marshallese migrants. Unemployment in the Republic of the Marshall Islands hovers around 36 percent. That's led thousands of Marshallese to legally migrate to the U.S. under a special compact from the Marshall Islands, comprised of two chains of volcanic islands and coral atolls far out in the central Pacific Ocean. Laelan says once here, a growing number of pregnant Marshallese women are engaging in private adoptions, lured by offers of cash and comfortable futures for their children. Islanders are accustomed to informal open adoptions back home, she says, where some experts estimate as many as a quarter pitch in and help take care of children from struggling families. Laelan says relations between birth mothers and babies are naturally maintained. But in Arkansas, private adoptions are a complex legal procedures, and unless clearly negotiated, contact is broken between birth parents and children. Laelan says this may not always be made clear, given they are paid to represent only the interests of adoptive parents, not birth mothers. U.S. states are required to approve and report public agency adoptions and foster cases. But in 1975, states were no longer required to track private adoptions. Private Arkansas adoption agencies are licensed through the state child welfare board. 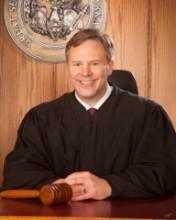 But independent adoption attorneys, who operate with no regulatory oversight, can earn more than $15,000 per adoption. Private adoption data is tabulated by county probate courts, but clerks queried for this report say the data is not broken down by ethnicity. More than 4,000 private adoptions have occurred in Benton County, according to probate court records and thousands more in Washington County over the past two decades. But the actual number of Marshallese adoptions taking place in Arkansas is unknown. Washington County Circuit Court Judge Doug Martin who hears adoption consent cases estimates that as many as ninety percent in recent years involve Marshallese children. “Here in northwest Arkansas it’s clear that most of the birth mothers are doing it out of financial need,” Martin says. Washington County Circuit Court Judge Doug Martin says a majority of adoption consent cases in his court involve U.S. born Marshallese children. Martin says he closely monitors all adoption proceedings in his courtroom, and with the help of translators, makes sure non-English speaking mothers understand what’s about to happen. “Awareness is the best thing we can do,” Martin says. Laelan says more pregnant Marshallese women are coming through her office than ever before with adoption questions. The demand for Marshallese babies began to rise in the early 2000s after bans and limits were placed on international adoptions by nations including Russia, Romania, South Korea, China and most recently Ethiopia. International adoptions have declined by more than 70 percent. Since then, images of adorable islander babies have circulated on adoption websites, as have certain private adoption lawyers claiming to specialize in Marshallese adoption. The RMI government in 2003 barred travel by pregnant islanders to the U.S. for purposes of adoption, creating a Central Adoption Authority. The travel ban constitutionally could not be enforced, but it also bars international adoption agencies from facilitating or soliciting Marshallese adoptions. Offshore adoptions by Marshallese nationals diminished for a time, but reportedly are increasing. The RMI also seeks to reduce the number of American-born islander children privately adopted in American states. A legislative proposal to limit the adoption of Marshallese children in Arkansas was drafted last winter by Rep. Jeff Williams, R-Springdale. But he withdrew the measure after constitutional concerns were raised. “If you call out a particular ethnicity in a law then you run into equal protection issues that are immediately problematic,” says Benton County Attorney, Josh Bryant. 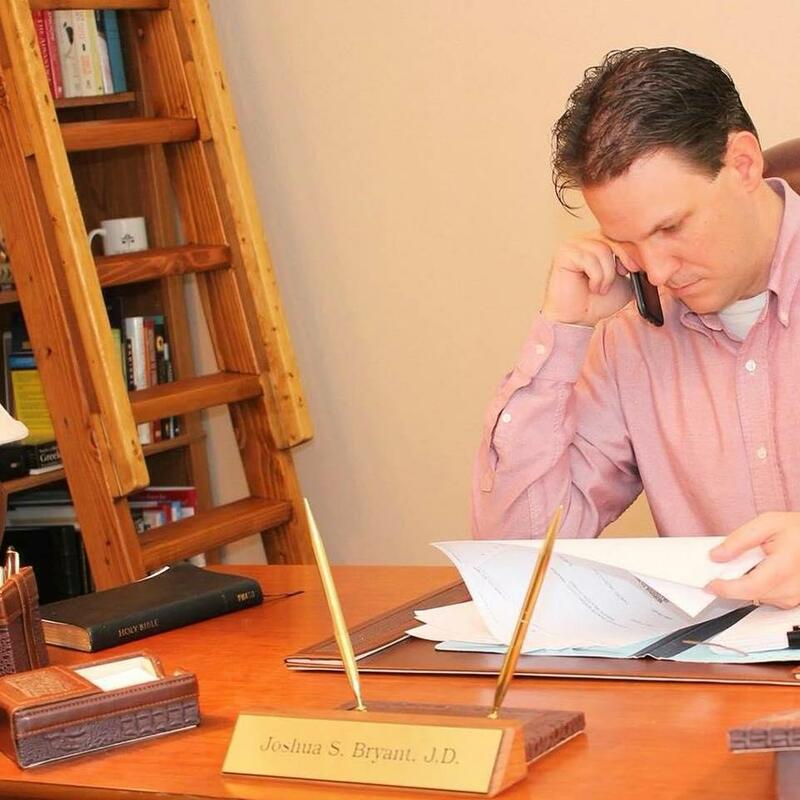 Josh Bryant, a northwest Arkansas attorney is working to reform Arkansas adoption laws. Bryant is working to overhaul Arkansas's private adoption laws. “We have been able to do a limited amount of research, and we’ve seen in Washington and Benton Counties about half the private adoptions are Marshallese,” he says. “The Marshallese population only makes up between two and four percent of the population here in northwest Arkansas, so that’s a gross disparity. This summer Bryant drafted an adoption reform bill which he’s shared with sitting members of the state legislature, he says, searching for sponsors. The measure, he says, aims to protect both birth mothers and adoptive parents. Bryant’s ten-page document is broad, most notably making it a felony to solicit a pregnant woman for a private adoption. The measure, if sponsored and approved, would make transparent all private adoption monetary transactions including attorneys’ fees and birth mothers’ compensation. He says under current law adoptive parents have to file with the court a statement of how money is spent, but billings and payments are not fully itemized. Bryant also aims to expand the legal definition of human trafficking in Arkansas. “To include moving people for the purpose of adoption,” he says. Arrest photos of Arkansas Marshallese birth mothers charged with breaching adoption consent agreements began to appear in northwest Arkansas news media several years ago. Bing Domnick, a Marshallese woman living in Springdale pleaded guilty in August to committing adoption fraud. Marshallese advocates worry individuals like Bing are being coerced into engaging in fraudulent adoption activity. Bryant says in Arkansas, once a biological parent relinquishes parental rights they have ten days to change their mind. Bryant says federal investigations into Marshallese adoption trafficking in northwest Arkansas are ongoing, but would not elaborate. “I have talked with the FBI and the U.S. Attorney’s office and were told to keep those conversations confidential,” he says. 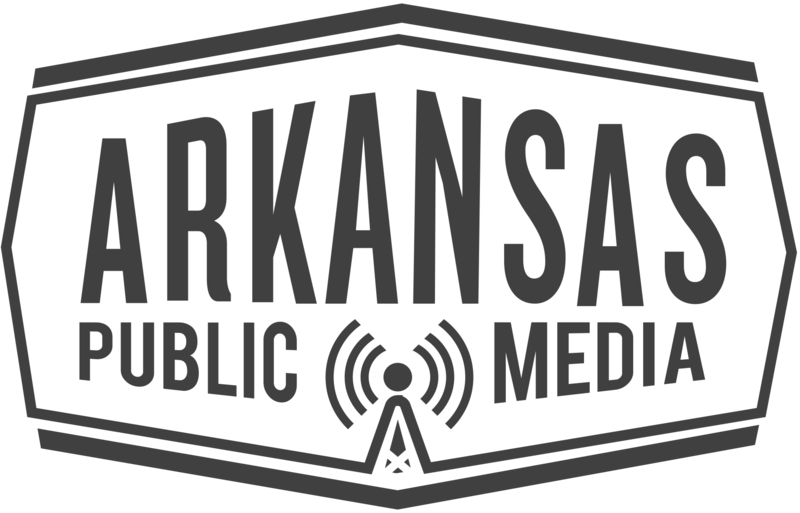 An email query by Arkansas Public Media to the U.S. Attorney’s Western District Office in Fort Smith yielded a response saying no comment. Bryant says he understands clearly what’s at stake, having openly adopted two Marshallese children. He later learned after adopting his first son two years ago that the birth mom had been handled by a baby broker. In recent years, online Marshallese adoption social support networks have formed in the U.S. to exchange best practices about ethical adoption and raising of Marshallese children. 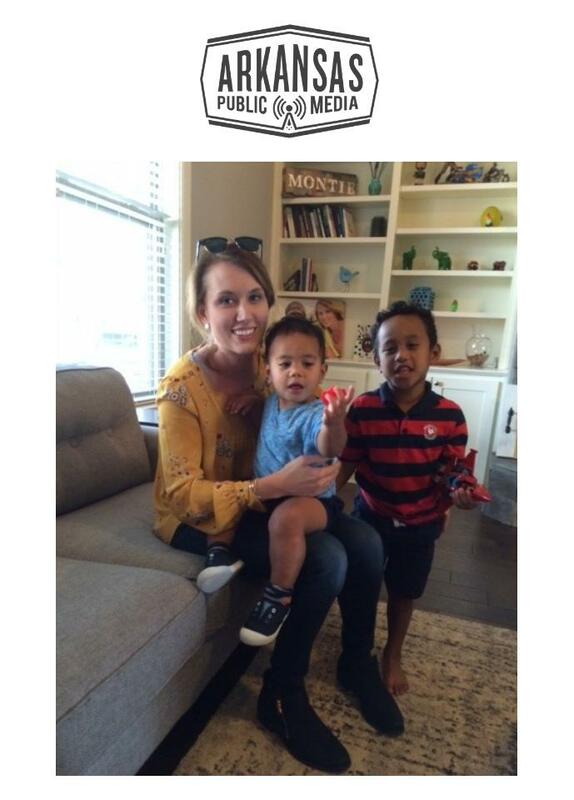 Michaela Montie adopted two Marshallese children. They cuddle with her on the couch inside her sprawling suburban Roger’s home, on a recent school day afternoon. Montie says she adopted her elder son, Asher, in 2013, when he was an infant. He’s turning five this month. Michaela Montie sits for an interview with her two adopted Marshallese sons. “And thru that experienced we quickly realized that our birth mom had not received a lot of social services support that we thought she would be receiving,” she says, “or access to medical care. So when Montie adopted Asher’s baby brother, Kade, in 2015, she took control of her birth mom’s prenatal care and comfort. Arkansas-born islander children became eligible, early this year, for publicly-subsidized Medicaid health insurance, called AR Kids First. But enrollment so far has been scant. It’s too early to tell if the benefit will reduce the number of Marshallese women giving up their American-born babies for adoption. 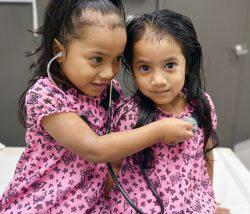 Two little Marshallese girls receive a medical checkup. “We provide legal representation and help make sure that they understand their rights and responsibilities throughout the whole adoption process,” she says. The services are free to birth moms she says. Kade suddenly begins to whimper and squirm, so Montie carries him to the kitchen to grab some orange popsicles from the freezer. Both boys, grinning, take the treats into the back yard to enjoy, in the warm autumn sunlight. 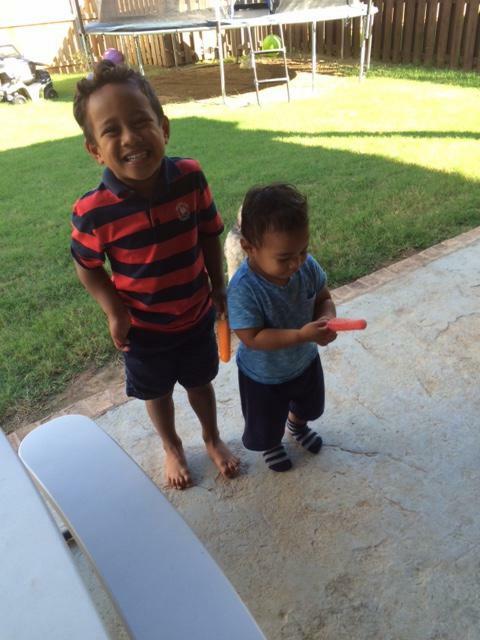 Adopted Marshallese brothers, Asher and Kade Montie enjoy popsicles in their back yard in Rogers. Montie says she negotiated an open adoption with both boys, and is learning Marshallese phrases and traditions such as kemem. The indigenous ceremony marks the passage of a one-year birthday, a major event on the remote and impoverished Pacific archipelago. “For Kade’s first birthday we invited his biological family out,” Montie says. Marshallese community leader Melisa Laelan says learning about Marshallese culture and maintaining family connections between birth and adoptive families is very important, but she’s encouraging islander birth moms to choose kinship adoption and guardianships to ensure islander children are raised by Marshallese -- softly reciting an islander proverb. Another islander proverb says a child will always follow the prevailing wind back to their birth mother. Hundreds of migrant and U.S.-born Marshallese babies and children in Arkansas now have college savings accounts, as a result of a collaborative program involving the University of Arkansas School of Social Work, Arkansas Coalition of Marshallese, state agencies, and a major Arkansas foundation. The Arkansas 529 GIFT College Investing Plan accounts are managed by the Arkansas Treasurer's Office, which has also donated financial support. Dr. Sheldon Riklon walks into an examination room inside Community Clinic in Springdale and greets his patient. "Iakwe," he says, and slides a stool over to Haem Mea, a shy Marshallese elder. The two speak softly to one another for a few moments. Then he poses this question: So what's it like to have a real Marshallese doctor in town? “Really helpful,” Mea says, grinning. Riklon is one of only two U.S. trained Marshallese doctors in the world. He relocated from the Hawaiin islands last year to Northwest Arkansas where the largest population of migrants from the Republic of the Marshall Islands in the world now reside. Dr. Riklon practices family medicine at Community Clinic, a federally qualified health center which last year served more than 36,000 middle- to low-income patients in Benton and Washington Counties, thousands of them Marshallese. And many of them are really sick. Children whose families immigrated from the Marshall Islands to Arkansas are eligible for publicly-subsidized health insurance in the state for the first time this year. Healthcare advocates are pushing, uphill at the outset, to get them enrolled. The extension of healthcare benefits for Marshallese kids is tied to a long history. The United States tested over 60 nuclear bombs on the Marshall Islands in the 1940’s and 1950’s. It caused long-term health and environmental damage according to some studies. That's one reason that the Marshallese started to leave the island. Tuvala native and noted Republic of the Marshall Islands political leader, Tony de Brum, died Monday in the capital city of Majuro. De Brum is also widely recognized as a global nuclear disarmament and international climate change treaty negotiator. De Brum often traveled from the Marshall Islands to the Arkansas Ozarks, where an estimated 13,000 Marshallese migrants are now settled, to visit family and friends and take advantage of employment, educational and health care opportunities. Marshallese are able to freely travel and live anywhere in the U.S. for as long as they wish with only a passport because of de Brum’s enduring political efforts.